The end of a year. For those who journeyed through a difficult 2018, the possibility of a new slate is a welcomed outlook. For others, the year was filled with fond memories and hold the hope for continued blessing. The end of a year has this unique and beautiful optimism that only a closed chapter can bring. We often reflect on the good and the bad, and look to the future with hopefulness. As you take in this time and embrace reflection, how can you make the most of this gift? What should you be doing to close 2018 and take on 2019? 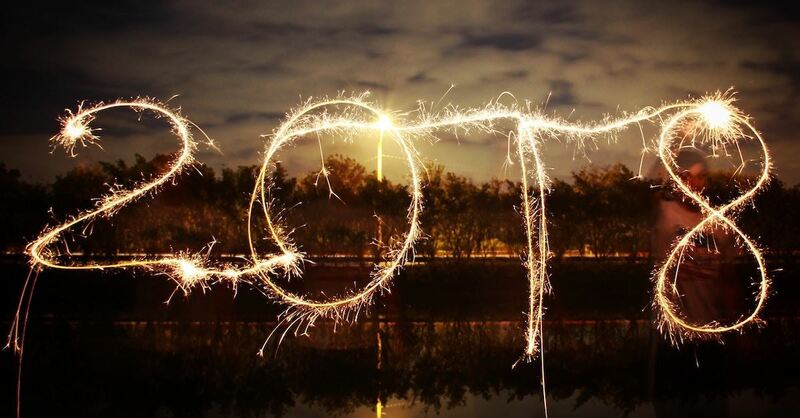 Here are 10 things you can do as you step out of this year and into a new year! 1. Write down what you learned in 2018. You would be remiss to exit the year without reflecting on what you learned. What did God teach you and show you about life, ministry, calling, and Himself? What lessons do you never want to forget? Take some time to think through all the lessons you acquired throughout the year. Maybe you learned something about yourself the hard way through a difficult trial. Perhaps truths were made aware of to you in Scripture. Consider all the ways God spoke to you and gather those lessons into one place so that you never forget. 2. Account for your 2018 blessings. No matter how hard your year was, surely God moved in beautiful and gracious ways. Every good gift—everything good thing you have--was given to you by God (James 1:7). Which means He deserves all the praise! Write down your blessings for the year and what you have to be thankful for. Then take time to bring thanksgiving to God for all the good He has done in your life over the last year. It’s important to end anything with praise and gratitude, being sure to keep the focus on the One who deserves the recognition for it all! Unforgiveness can eat away at you and steal the joy offered by reconciliation. Don’t take that kind of baggage into 2018 with you. It’s time to forgive others and yourself. If there is a family member or friend you’ve been unwilling to forgive, pursue it now. Perhaps you were the one offended and now wait for them to approach you—make the first move. Forgiveness is such a beautiful gift extended to us by God; share it with others. Maybe it’s not another person. Are you struggling to forgive yourself for making a heartbreaking decision or epic fail? If God can extend grace to you, how about extending a little grace to yourself. No person is perfect but God’s love is and He’d rather you live in the fullness of His grace than in condemnation. Step into 2019 with a full heart made possible by forgiveness. 4. Make one last play for those 2018 goals. Did you set a goal for 2018 and have yet to fulfill it? Something really important for you to accomplish? Don't think the window of opportunity has passed. Make one last go at accomplishing that goal. The year isn’t over yet! 5. How will 2019 look different? Now is a good time, after reflecting on 2018, to determine how you’d like the next year to look different. Maybe it’s walking in forgiveness this next year, for example. Perhaps you’re ready to make a go at pursuing your dreams instead of settling for less than what God has purposed you for. Do you feel the pull to be a better leader of your family, men? Or ladies, to put aside comparison? I don’t know what you struggled with in 2018 but if there is something you’re ready to leave in the past for a better 2019, what does that look like? 6. Define who you want to be in the new year. Similar to the previous step, yet more definitive, what kind of person do you want to be in the next year? We all have an area within us we are determined to grow in as a human being. A more gracious spouse, kinder co-worker, attentive parent. Or to finally let go of some of that pride, insecurity, or lust. Maybe it’s to be a more devoted follower of Christ. Define the kind of person you want to be. A good start, if you’re not sure, can be found in Romans 12:9-21 with the marks of a true Christian. Resolve to be a better you in 2019—not by your own strength, but through Christ's. 7. Identify a theme for 2019. Every year I spend time in prayer and determine a theme for the new year. A word and Bible verse to guide an area I’d like to grow in. I would highly encourage you to pray and get into the Word to determine a guiding theme for the next year. An area you could grow in. Do you want to go “deeper” with God? Perhaps pursue “humility” to conquer a spirit of pride. Whatever that may look like for you, determine it, get it in you, and pursue it in 2018! 8. Write out your 2019 goals. Some might call them resolutions but I like the term goals a bit better. Something to aim for. You might not hit the mark on all the items but if you don’t aim for something you’ll never achieve anything. Write down goals for the year that you would like to aim for. Start that small business you’ve dreamed about for years by writing a business proposal. Finally take that cross-country road trip with your family. Increase your giving in finances, time, and kindness. This is a place for your dreams to begin or be renewed with commitment. The year is wrapping up and whether it was good or bad, it’s cause to celebrate. Time to usher in a new year! Plan a family get-together at your house or hit the town with some friends on New Year's Eve. Make the transition with your community and have some fun! 10. Rest and enjoy Christmas! More than anything, enjoy Christmas with your friends and family, celebrating the birth of Christ. Get the perfect ratio of rest and merriment this week with renewed optimism for a new year!